Some time ago we had a retaining wall built out the front and arranged it so that eventually we'd put a little fence in between pylons. 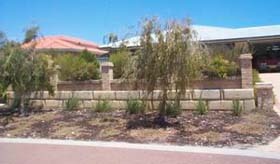 Originally the intention was wrought iron but the "evolution" of the house had gone more of a wood feel with 2 other lapped jarrah fences already out the side. 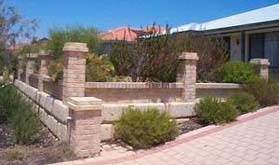 The idea now was to extend this theme to the retaining wall, but how would it look? Don't guess, do a demo! 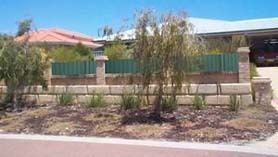 I took a before picture of the retaining wall, a picture of one of my existing fences (for a sample bitmap "texture") and used my favourite photo editor to generate a predicted picture; a demo if you like. Original look before the little fence. What it actually looks like once finished. in handy gettin' it all home. Attack! Attack! 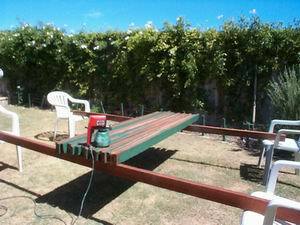 The wood I use is Jarrah and Karri which are very similar Australian hardwoods. 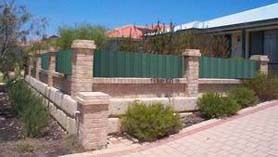 75x20x1800mm rough sawn pickets sourced from Colli and Son will set you back $AUD1.24 (2001) each and 65x35x200 lengths for the frame at about $AUD2/m (2001). The design is really simple. Two lengths of the 65x35 make up the frame which is attached to the wall, the pickets are then attached to the frame, overlapping by around 10-15mms. I'm pretty sure I've said this before, but let me state it again in no uncertain terms: PAINT EVERYTHING ON THE GROUND! A batch of planks at a time, rotated and painted. I use for painting what I affectionately refer to as a "splatgun". They are about $AUD50 (2001), you fill 'em up with raw paint, press the trigger and a small electric piston inside them cause the paint to come splatting out. It doesn't use air, the paint is atomised at the nozzle. They do a superb job on rough sawn jarrah, fantastic. Rough sawn needs a lot of paint for good coverage, these splatguns really push the paint out hard. I reckon the difference between painting with a brush and a splatgun would be 3 hours versus 10 minutes per batch. Seriously. 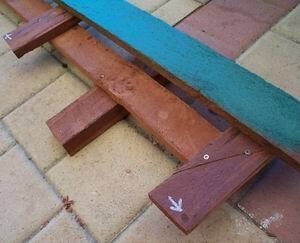 Lay out the planks, give them a dust off with a firm brustle and paint. Rotate every few hours to get all sides done. Paint is Watyl Solarguard, about $AUD110 (2001) for 10 litres - I ended up using 9. 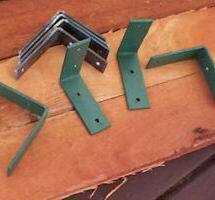 While the paint is drying, make some brackets. Sure, you could buy some but why not grab $AUD6 (2001) of steel bar and bash some up? 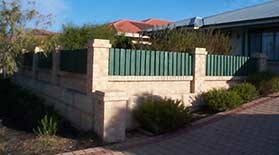 Brackets are used to secure the fence frame to something, in this case the retaining wall pylons. Bar used here is 20mmx3mm. Bend brackets over in vice... ...Splash on some paint. 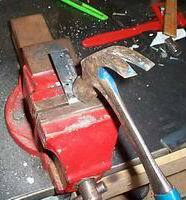 The only real tip I give here is that when you bash the 90° bend in them, hit the outer edge of the bracket in the vice to start with, as it gets further and further and further around hit right at the bend, hard. 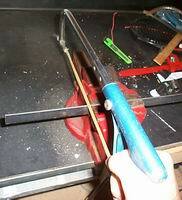 When the bend has reached 90° the steel will be a bit banana shaped, hit the outer end again to square it off. It doesn't need to be too accurate, eyeball it and leave at that. Screw the bracket in place. Wall plugs. Hated by some but loved by me. I have a passionate dislike for dynabolts *except* in mega-heavy duty situations, for everything else use wallplugs. Don't use the recommended masonary drill bit size though, always go 0.5mm smaller. It ensures the fit is snug and that the plug won't spin when you send the screw home. Tap in the wall plug. Get the frames up. I made some "chocks" which I wrote on 100m and 310mm, representing the length of the chock. By resting two 100mm's on the wall and laying the frame wood on top I got the bottom piece lined up, then the 310mm's on top of that to get the top frame piece lined up. 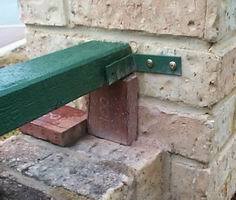 I used another chock to measure out the distance from the front wall on the bottom piece, and a spirit level to ensure the top piece was plumbed up with it. Okay, I've got pickets that are 1800-2000mm long and need 600mm lengths. I've estimated I need 300 pickets. 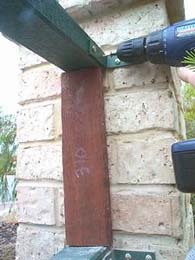 Given that you will use a circular saw to cut the lengths up and trim off the grotty existing ends that is 5*100 = 500 cuts. That's a lot of measuring and cutting. Time to make a jig. "Cut here" at the arrows. The idea of the jig is so I can simply throw down a couple of pickets at a time, put my foot here, cut cut, put my foot there, cut cut cut. Where each cut is indicated by a mark in the jig. Ah, the pictures will tell the story. This jig was cunningly planned so that each picket fell off at the completion of each cut while the last cut still had the picket firmly in the jig. The whole jig, with two pickets on it ready to be sliced up. Home straight... Basically hold the pickets in place and screw 'em in. Note that I said "screw". Now I've got nothing against nails, but the previous fences I've built I found that as the wood seasons it can pull nails out or even pull the wood past the nailhead. 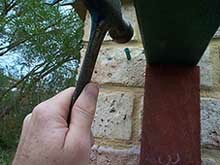 Screwing will cost you a few more dollars (a screw might be 15c where a nail is 3c) but we are talking and extra $AUD30 (2001) more for something that will never, ever come out. 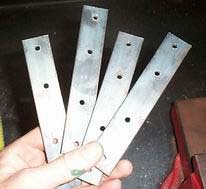 Hey you saved that $AUD30 making your own brackets, remember? In order to screw the pickets in I held the first one down, pilot drilled a top hole and then using the cordless screwdriver put a screw in. 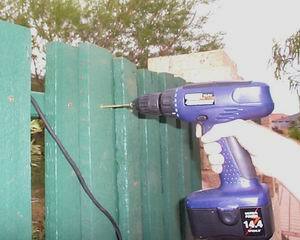 Then, using a spacer I placed the next picket and screwed that top in. I continued until I was getting close to the end, where I'd put the very last picket in and guestimate how big the gaps should be so that the in between pickets would evenly fit. With the first row finished I then stood back, tapped any of the pickets straight by eye (remember the bottom is not attached yet) and when satisfied I pilot drilled and screwed all bottoms in. The top lapped row is pretty much the same except throw away the spacer and use the first row screws as a centre guide. Screw all tops, stand back and straighten, screw all bottoms. As before. That's it. Paint over the screwheads and flat-top the pickets. I did this by pencil ruling a line along the top and using the circular saw to buzz the tops. 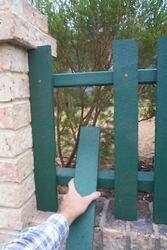 This way any imperfections in the cut lengths of the pickets caused by the uneven wall underneath are accounted for. Total price; around the $AUD350 (2001) mark which is mostly the wood at $AUD160, paint at $AUD110 the rest miscellaneous fixings.